Isn’t “poppycock” a great word to pair with “peacock?” I just had to use it, even though I realize peacock and poppycock never would have been joined in the mind of my main subject today, Flannery O’Connor. Still, it’s a great and underused word that has a barrage of colorful synonyms: hogwash, claptrap, balderdash and moonshine. On a more serious note, though, to Flannery, as many who know her know, peacocks were nothing to undermine. 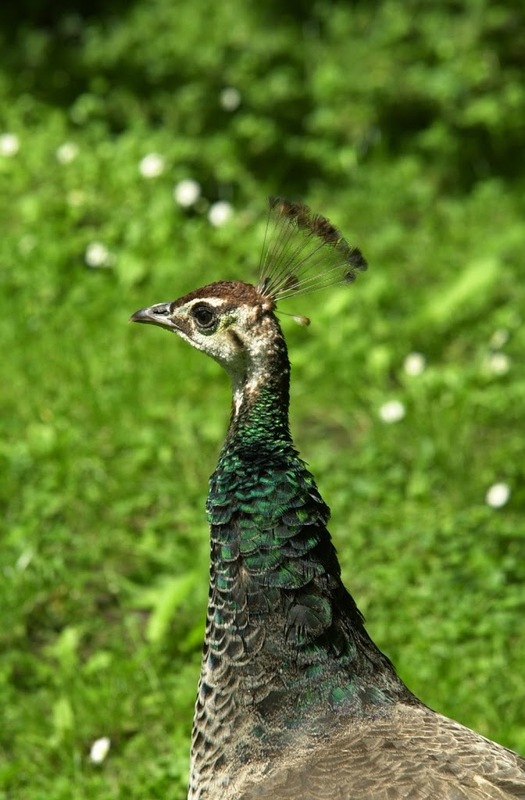 They were precious companions and her association with them is undeniable; peacocks are part of how the world has defined her through the years. The writer herself went much deeper than any one visual could convey, and I want to share a bit of that with you today as I prepare to embark on an important journey. By the time you read this, I will be well on my way! Soon, I’ll have an even clearer picture of this gifted woman when I join a small group of pilgrims to explore the grounds where Flannery once trod. I’ve been talking about this adventure on my weekly blogs, Peace Garden Mama and Peace Garden Writer, the past couple weeks and wanted to extend my reflections to Catholic Mom readers. After all, Flannery should pique the interest of most anyone who loves the Church. She’s certainly gotten mine. For a quick introduction to Flannery, go here. You’ll learn that she was a highly regarded writer, pegged by many as a faith writer, and known mostly for her fiction, which was perceived by some as bordering on the dark and sometimes grotesque. She died early, at 39, of lupus. It’s true that some of her writing makes the reader a bit uncomfortable. At least that’s how I reacted to her first novel, “Wiseblood.” But since then, I’ve come to understand her work better, and certainly the person behind the book, and I’m now of the opinion that Flannery O’Connor is completely worthy of our interest as people of faith. What I’ve learned from Flannery so far, especially through reading her letters compiled in “The Habit of Being,” has been so rich that I want you all to this know this side of Flannery too — the interior life, the life behind the books. I’ve been reflecting on what my draw to her is, and I’ve boiled it down to a couple main areas. One, as a fellow writer, I am finding that reading her letters is like setting a weekly coffee date with a writing mentor, picking the brain of one of the best to find out how the writing life worked in the life of one who lived it well and was successful at it. People pay good money for this, but you can get it right from her letters and works. Even more, as you quickly see in reading her letters, is the faith component. Flannery’s faith was dear to her, and she was very frank about this. She was famously known for saying that if the Eucharist was just a symbol, then to hell with it. Harsh at first glance, but ponder the feelings behind the words and you’ll find a woman completely in love with Christ who wasn’t willing to accept anything other than the real deal — body, blood, soul and divinity. She was brought up and educated in the faith, but in a land and time that was often hostile toward it. I can identify with this; with her feelings that she’d come upon a gold mine that so many around her didn’t see. Flannery stepped in as a mentor when the opportunity presented itself to her, but never by force, leading non-believers and others in her midst as well as she could toward the Church’s goodness, truth and beauty. Perhaps most important of all is this. Through her letters, Flannery teaches us one of the most important lessons we can learn on this earth: how to die well. I’ve been taking in her letters Southern-style — slow and easy, little by little. I actually started several years ago, put them down, and only recently started up again. I’m currently on page 427 of 596, and what I know is that by the end of the book, Flannery will be very close to death. I know that what I’m reading is the letters of a dying woman. But not just any dying woman. A dying writer, a woman of faith. All these things draw me to Flannery. I, too, am a writer, a woman of faith, and one who enjoys nurturing others. But beyond that, like Flannery, I am a dying woman. No, I don’t have a chronic disease like she did — at least not that I am aware of. But I am dying. We all are. We might as well face the fact, own it, and live like we know it. Does that make sense? I’m not trying to be morbid here, but morbidity is in the works for all of us, and there’s no better way to learn how to die well than by one who knows she is at death’s door, but also, has a deep and abiding faith; one to help make that journey – the one we all will take – be the best it can possibly be; the most meaningful, the most thoughtful, the most embracing of the cross. Through reading her letters, I also am able to see something very special that she may or may not have seen. God gave Flannery the gift of writing. It was a gift to the world, but more than that, it was the fuel that kept her moving forward. Flannery was able to handle her dying with as much grace as possible because she always had another word to write, another sentence to fashion, another story to tell. This is what kept her moving along, what gave her hope, and I find that beautiful. She was dying, and yet a young girl who had recently contracted the same disease befriended and visited Flannery in her home because, as Flannery said, she seemed to be managing the disease so well and the girl seemed to need hope. We all need hope, and Flannery’s hope was in her writing. That’s how God blessed Flannery most of all. And through reading her writings, I am finding the same kind of hope and blessing. Please join me and my little entourage of fellow pilgrims. We are all Catholic writers. Christina is a young, single woman with lots of energy and the whole world before her. Karen is a mother and grandmother who has seen a lot of suffering, and is still enduring it, but who clings mightily to her faith in an inspiring way. And I am a middle-aged mother of five presently trying to survive with three teenagers in our home. I’m in the pit people, and I need all the hope I can get! We don’t know exactly what we’ll find on our adventure, but we’re intent on finding it as we stroll through Flannery’s home turf, and we’d like nothing more than for you to join us. I’m hoping to blog daily at my regular place, so if you’re inclined, please pop on over to Peace Garden Mama this next week and see what we’re up to, and how Flannery has led us toward hope and light. Q4U: If you could visit any writer, past or present, who would it be and why?